As a crusader for social justice, Germany’s Monika Kruse brings much more than techno to the global dancefloor. From Munich to Miami, her mission to give back has left a trail of fervent fans in its wake, eager to share in her music, her motives and her open heart. A sea of arms stretch toward the DJ booth, fingers fluttering in the thick, smoky air: “I LOVE YOU, MONI!” screams a voice, hoping to be heard over the bass. Monika Kruse tosses her head back with a wide smile and extends her own arms out across the CDJs, straining to touch the fingertips of the young man who has professed his passion. He grasps her hand for a beat. As the music crescendos, the crowd around him elicits a loud roar: their techno queen loves them back! Monika’s thick blonde curls quiver with each kick, illuminated by a single, glittering disco ball that flashes its own smile. She curls her fingers into a heart shape, raising her arms high into the air, and the dancefloor responds in kind. The energy in the room is as palpable as the humidity dripping from its glass-domed ceiling. Monika Kruse is on her throne, surrounded by fans who shout her name at every break in a song, at a legendary techno festival where she has reigned supreme for two decades: Time Warp has descended upon Mannheim, Germany for its 23rd year, and DJ Mag is pressed against the back wall of the stage, watching one of the party’s most revered veterans guide her audience through the night. “When you’re in the hotel lobby you can feel the excitement – it’s like Christmas!” Monika declares, clapping her hands together with a grin. She’s right. Mannheim’s Dorint Hotel is ground zero for Time Warp’s techno-star-studded roster and their entourages, production crew, media, and dedicated ravers who are lucky enough to snag a bed. The hotel bar is an unofficial rendezvous point for drinks and chatter before the 18-hour-long affair kicks off. Richie Hawtin saunters past the front desk on his way to dinner as the lobby buzzes amid a sea of black clothing and folded sunglasses. An Ibiza event producer passes us a shot of Hierbas. He’s brought a bottle of the Spanish island’s famous liquor in his luggage, just for the pre-party. We offer Monika a drink, but she politely declines with a shake of her head, brimming with nervous energy before her set. For an artist with 25 years of DJing experience under her belt, we expect that even an event this grand would be old hat. But Monika assures us that this is not just any party, as she ducks into a nearby elevator and heads back to her room to prepare for the night ahead. Monika Kruse’s dedication to her craft is more than a consequence of her native German efficiency. It is a reflection of the deep-seated passion that she wears – along with her heart – on her sleeve. She speaks of love and emotion, of empathy and insight, of a desire to help other artists and please her fans, as often as she speaks of records and production equipment. Her frank communication style and lack of pretense may in part be cultural, but her genuine concern for the people, places and things outside of herself is entirely her own construct. Born in Berlin, Monika was raised in the decidedly less hip, Bavarian capital of Munich, 360 miles to the south. It was there that her teenage love affair with dance music took root. She found early success throwing illegal raves in warehouses and on empty, moving trams – “I always had someone in the group with a birthday, so I’d call it a birthday party and never got a fine,” Monika laughs. She quickly graduated to playing regularly alongside Sven Väth in the mid-nineties, and holding down residencies that have become the stuff of legends at clubs like Munich’s infamously wild Ultraschall, long before Berghain was a glimmer in its founders’ eyes. Monika’s move back to Berlin as an adult was inevitable, but her career path is far from ordinary. 26 years ago, when Monika Kruse began her DJing journey, the dance music scene was challenging to navigate – even in the cities that embraced it the most. Being a young female artist in a burgeoning musical niche where women were more often go-go dancers on podiums than DJs on the stage, meant that the uphill climb was even steeper. The Berlin wall had fallen just three years prior, the AIDS crisis was raging, and discrimination of all kinds, from gender to race and sexual orientation, was less scrutinized than it is today. Those themes left a significant mark on world culture, and similarly, on Monika Kruse’s path as an artist. She laughs modestly and brushes a lock of hair back from her face when we remind her that “kind of” is not an accurate qualifier of her success. 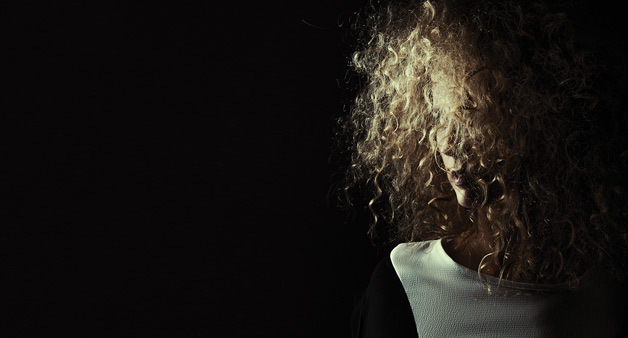 Try walking into a German club with Monika Kruse in tow for confirmation: her tall, statuesque frame, mop of wild blonde curls and striking cheekbones are enough to stop anyone in their tracks, but it’s her prowess as a DJ/producer and longtime techno tastemaker that keep people shouting her name. “I think we must always do what the heart needs to do, and not what social pressure or opinion makes you do. And I’m really happy that my parents never put me under pressure.” Monika speaks softly and carefully, always seeming to consider her thoughts before forming them into words. As a young child, she benefitted from music lessons and a family who encouraged her. She explored genres, fell in love with funk and soul at an early age, and quietly amassed an impressive record collection which to this day, influences her performances and vocal-infused, emotive productions. “But I’m an only child,” she shares. “My parents broke up, and for me, I think music was a way to overcome feeling alone. My whole system broke down – about love, about relationships, about marriage. Music became my best friend.” With her allowance, Monika began buying records instead of makeup or clothing like her teenage girlfriends. She pooled her pocket money together to secure the latest vinyl – first, funk and soul, then the early electronic dance music that began filtering into German record shops from Chicago, Detroit and New York soon after. Monika’s vulnerability is contagious. We want to tell her our stories, too. That sense of vulnerability translates to her work, and is one reason why so many ravers over the years have connected so deeply to it and to her. Her eyes light up when she speaks about discovering new artists and helping them be seen and heard. Some of today’s top-tier house and techno talent can thank Terminal M for giving their music an early home – Andhim and Stimming among them – and the label continues to showcase a mix of breakout artists and established stars without getting stuck in a single style. Two of Terminal M’s standout, recent releases are prime examples: ‘Lila’ EP is a hypnotic trio of tracks by American producer Clint Stewart, while ‘Get Me On’ EP sees Monika Kruse team up with her long-time friends and collaborators Pig & Dan for a melodic ride that stands in stark contrast to the heavy, masculine techno the latter duo is known for. “These were some of the most emotional productions I’ve done in the past few years,” Monika says of her two-track ‘Get Me On’ EP. When we later watch her play them both, in the early morning hours at Time Warp, the crowd reaction confirms her statement. Emotion ripples across the dancefloor in a wave of flailing limbs and wide grins. The National Organization for Women, aka NOW, is an American feminist organization that goes by the motto: Taking Action for Women's Equality Since 1966. With chapters in all 50 states, it is the largest group of grassroots feminist activists in the United States. From women’s reproductive rights and LGBT rights to civil rights, NOW activists use both traditional and nontraditional means to push for social change. Fittingly, for the woman who has thrived through nontraditional approaches to life and always champions the underdog, Monika Kruse plans to donate all the profits from her fall US tour dates – September 8th at Marble Bar in Detroit, and September 9th at Heart in Miami – to NOW. “The party is not the DJ; the party is everybody,” Monika states. She’s speaking about Time Warp, in the calm before the storm that will be her set, but it seems an apt metaphor for her general approach to life, her career, her craft and her record label. The woman who was once a shy teenager collecting records in Munich, has long been a crusader for social justice, informed in part by the era in which she grew up – the reunification of Germany, the AIDS crisis, global shifts in discrimination – and by her own experiences in a music community comprised of people from all walks of life. In 2000, she founded her No Historical Backspin charity, which has raised a significant sum of money to date, benefitting people targeted by racism, homophobia, anti-Semitism and anti-immigrant dogma. She continues to devote her efforts to a wide variety of charitable initiatives, with a benefit gig at Berghain that raised over 20,000 Euros for Amadeu Antonio Stiftung, an organization aiding victims of discrimination and violence, and donating an apartment to Syrian refugees who were adopted into the Kruse family in the wake of Germany’s recent refugee crisis. “I always think that there are a lot of regions of the world where I can do something, with organizations I want to support and which touch me and what I believe in,” Monika explains. When she witnessed the massive, global gathering of people for the Women’s March this past January, she was inspired by its roots in the US, thanks in no small part to NOW. In true Monika fashion, she decided then and there to support them. “I never heard about NOW before that, but I thought, hey, if I'm in the States I can give them the money I earn from the States, so it stays in the States, you know?” she grins matter-of-factly, as if this were the obvious choice. The causes and people to which Monika Kruse chooses to devote her time, money and energy to are varied, but each has touched her personally. No Historical Backspin was founded during the period when Germany experienced its first resurgent wave of right wing racism. And as a female artist who still experiences sexism, even at the height of her fame, seeing the global Women’s March inspired her to take action by donating both personal funds and gig proceeds to NOW. “You don’t get immediate support in this industry when you’re starting out as a woman. You have to fight. You have to fight and you have to prove yourself [more than men]. We have to prove that we collect records, that we're hungry for the music, that we really live the same kind of lifestyle like the men do. When Monika was a record-collecting teenager, her boyfriend was a DJ. Impressed by her encyclopedic knowledge and passion for music, he asked why she didn’t DJ too. “Well, because I’m a girl,” Monika told him. At the time, there were no female DJs to lead the way. Her boyfriend urged her to try it, and helped her get her first gig at a local bar in Munich. The rest is history without backspin, but Monika emphasizes the need to focus attention on gender inequality, both socially and throughout dance music. 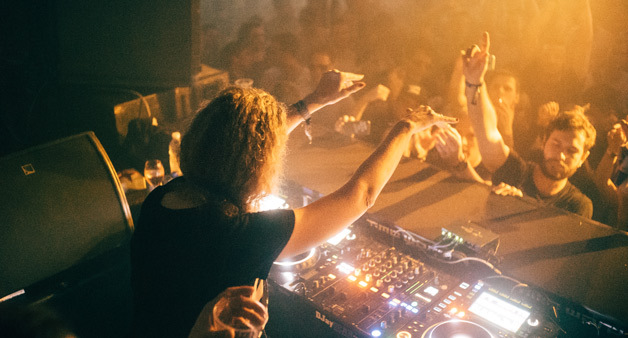 While she admits that in music, at least, the state of affairs is slowly improving – back-to-back sets which were a traditionally male affair, have begun to include a mixture of men and women, Monika’s dynamite Boiler Room b2b with Andrea Oliva among them – she still encounters her share of latent sexism despite her achievements. Time Warp concludes its raucous debauchery on a bright, cool Sunday afternoon, after 18 straight hours of sweat and snare drums. Back at the Dorint Hotel, we peel off our sticky socks, unwrap granola bars and flop down onto clean bedsheets beside a pair of equally exhausted friends. Monika Kruse knocks on the door, still buzzing with excitement in the wake of her performance. Incredibly, she manages to look fresh and alive, her skin glowing and clothes unspoiled. She greets us with warm hugs and joins for snacks and a recap of our respective escapades, delivered with a dose of laughter and face-palming. We cue up some music on a laptop and everyone takes turns selecting old rave classics, exclaiming loudly each time a new track starts and regaling one another with old party stories associated with each song: that time our bus got stuck in a pit of mud; that time we spent an hour diverting security only to realize we were at the wrong stage; that time we got locked inside a portable toilet. Outside, the sky begins to pale with early evening light, and someone throws open our room window for fresh air. It opens onto the Dorint Hotel’s large, inner courtyard, and a wall of windows to other rooms faces ours. Like a scene from The Muppet Movie, a sea of heads, arms and hands pop in and out of the windows, some smoking cigarettes, some calling out to friends across the way, others still dancing to the beats of the night in their heads. The faint sounds of house and techno music drift across the courtyard and seep into our room. We yell and wave at our weary neighbors, as Monika pokes her head out to survey the landscape. “MONI! MONI, MONI, HALLOOO MONI!” She has been spotted by guests in the windows, and the quiet hotel courtyard springs to life. Fans and friends stick their arms out; some want to say hi, most want to praise her set, one waves what looks like a washcloth and asks for an autograph. Monika laughs, delighted by the surreal scene, and climbs out of our hotel room window onto the large courtyard terrace below. If not for the adult context, it’s a page out of a children’s storybook. She graciously greets the people in the windows above, walking along the building perimeter as if holding court; raising a hand to some, stopping to chat with others. Back inside our room, we wonder what we might eat for breakfast at 5pm. Monika returns through the window after making her rounds, brushing her hands off with a satisfied smile. A liquid drum and bass track plays from the laptop and everyone sighs with pleasure – something different, softer than techno, a welcome after-hours break from heavy 4/4 beats.